Custom Printables from invitation to programs and favors. So Bliss! Ink is a part of So Bliss! 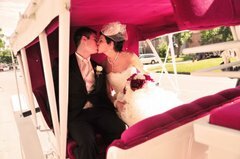 Wedding Design which designs weddings and florals from start to finish. Cari was very helpful on our wedding day! She made sure all the details were handled, so we could relax and enjoy our day.